Linlithgow players lining up to congratulate Tommy Coyne on scoring has become a familiar sight at Prestonfield over the years. 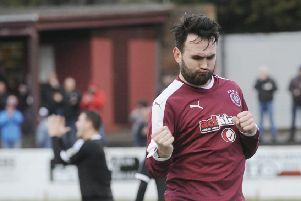 Linlithgow Rose have heaped praise on Tommy Coyne for his remarkable goalscoring exploits with the club over the past 10 years. The 31-year-old hit his 300th – and his 301st – goal for the club during last Saturday’s 5-1 South Region Cup win over Heriot Watt University at Prestonfield. Club president Jon Mahoney made a special presentation to the striker after the game in recognition of the landmark – and says Coyne’s achievement is one which may never be repeated. He told th Gazette: “It takes a level of loyalty which you don’t see so often in football these days to achieve a landmark like that. 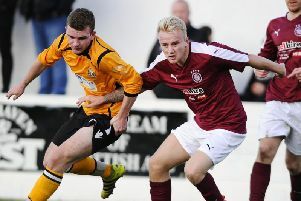 “You can only really put Tommy’s achievement in context when you think that it’s take 129 years for someone to score 300 goals for Linlithgow Rose. “Goalscorers get the limelight but this guy has had an incredible record. You’re talking about an average in excess of over 30 goals a season. Coyne will he hoping to add to his tally this Saturday when Rose welcome Highland League strugglers Fort William to Prestonfield in the senior Scottish Cup. Fort William are bottom of the Highland League and have shipped 81 goals in their 18 games so far this season – but boss Mark Bradley will take nothing for granted as his side chase a place in the second round of the competition.